Every night, Damjan and I go through Mia’s bedtime routine: feed, bath, read a book, sing a lullaby, and into bed by 7:30pm. Then it’s time for adult conversation, which is a real treat for me after a whole day of ‘Un gah gah’ and ‘A boo’. 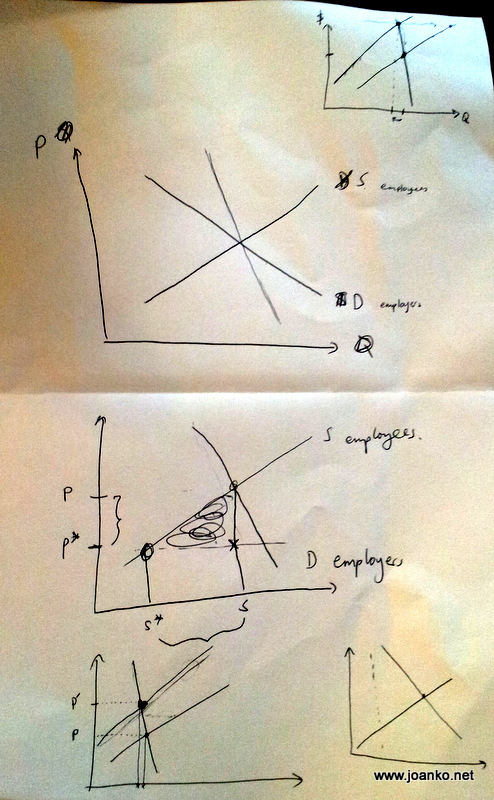 Here are the demand and supply curves that Damjan and I drew one night, when we were trying to work out how is it that a regulated minimum wage does not lead to unemployment. 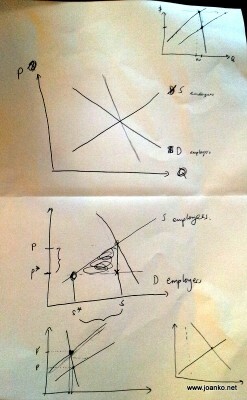 Damjan argued that the mechanisms for this effect could probably be shown with conventional demand and supply curves. I wasn’t so sure.